We’ve been really bad at providing updates on what we’re actually working on… This is me trying to remedy that! We’ve altered our focus somewhat the last 6 months, we’re still making Corp Wars, only a bit further into the future. Corp Wars is an ambitious project and we just don’t have the resources to develop it like we want at the moment. So therefore we’ve been working on a smaller game, for mobile, set in the same setting as Corp Wars. 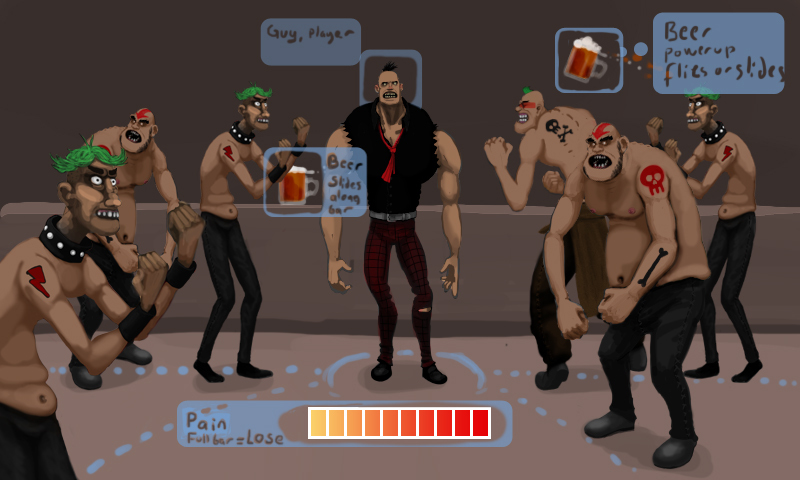 In the game you will have to defend yourself against aggressive bar patrons that want to beat your face to pulp over several bar levels, in the wastelands of a post-apocalyptic future. Any beating you receive will give you pain and any beer you drink will reduce said pain, but beware! The more alcohol you drink the more drunk you’ll get! I won’t promise any regular updates like I have tried to do before. We’re currently only a two-man team and all our time is dedicated to develop this and future games, so there will be a new update when I find the time for it. Until then, best way to be notified of any updates is to like our facebook page and/or follow us on Twitter.